The month of January, 2014 has been a very special month for Manick Sorcar Productions. To begin with, a two-hour Indian animation series of Manick Sorcar rang in the New Year for the Mid-Western States of the USA. Then the production group had to fly to India for a cyclonic tour through Bangalore, Mysore, Pune, Mumbai, New Delhi and Kolkata – where it was invited in commemoration of 150th birth anniversary of Swami Vivekananda. Most programs were organized by the Ramakrishna Missions in collaboration with the Ministry of Culture, Govt. of India. 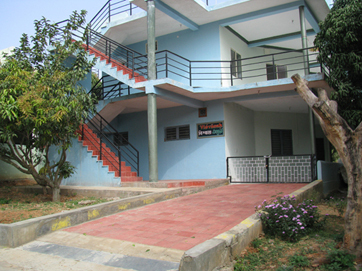 (Right) Adjacent to Mangala Mandir Theatre, both at SVYSA University, Bangalore. Performed at the Prashanti Kutiram, International Head Quarter of the Swami Vivekananda Yoga Anusandhana Samasthana (SVYASA), Bengaluru. It was held twice, first on 2nd January at the Mangala Mandir auditorium (packed to capacity with 1800 people) as the Grand Opening item for the 20th International Conference on Frontiers in Yoga Reasearch and its Applications, and the second on January 5 at the famous Malleshwaram Ground, inside the heart of the city, for its Grand Finale as well as in commemoration of 150th birth anniversary of Swami Vivekananda. The second show had a vibrant 5000 people at the exterior thrilled to watch the show of a lifetime. The Sorcars were felicitated on the stage amidst a cheering crowd. 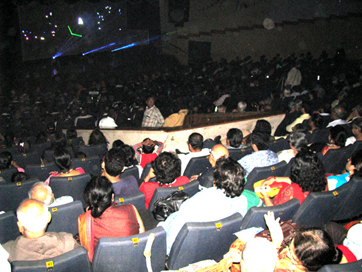 (Left) Partial crowd at Mangala Mandir Auditorium, SVYASA University, Bangalore. “Surely, the Laser Show was the greatest hit in our conference during the inauguration on January 2nd night in Prashanti Kutiram for the gathered 1800 persons and Mangala Mandir was never so full”….”The motions of the Laser beams touched the emotions of the hearts”…said the Editorial reviews for the show in VYASA’s online magazine. (Right) The Sorcars are felicitated by Prof. Ramachandra G. Bhatt and Prof. NVC Swamy after the show at Prashanti Kutiram, SVYASA University, Bangalore, on January 2, 2014. (Photos reproduced from online). Sea of people! 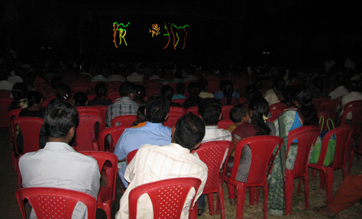 A part of the 5000 people at the Malleshwaram Ground, Bangalore, watching "Swamiji" the laser show on January 5, 2014. (Photo reproduced from online). “It was such a delight that you gave us two shows. It was the greatest hit of our conference.. The motions of the Laser beams touched the emotions of the hearts”… wrote Dr. H. R. Nagendra, Chancellor, SVYASA Yoga University, Bangalore. 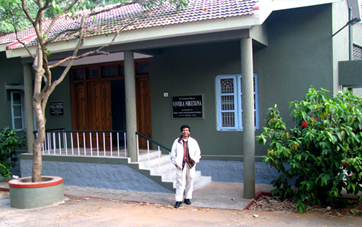 the International Guest House where the Sorcars resided during their show at SVYASA University, Bangalore. Performed at Sri Ramakrishna Ashrama, Yadavagiri, Mysore. The show took place at the exterior, where an enclosed, massive stage was built by RKM to the specifications of MSP. An estimated 3,500 people watched the show. 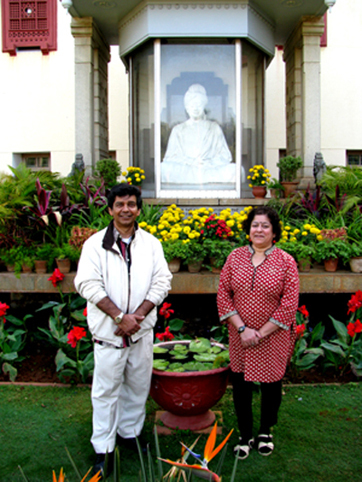 (Left) Manick and Shikha Sorcar at Sri Ramakrishna Ashrama, Yadavagiri, Mysore, Karnataka. 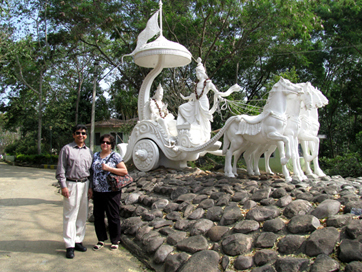 (Right) Near the Guest House where the Sorcars resided amidst the greeneries and peaceful surroundings. 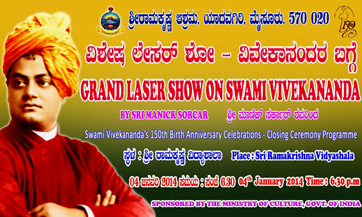 (Left) A colorful publicity poster for the “Grand Laser Show on Swami Vivekananda”. 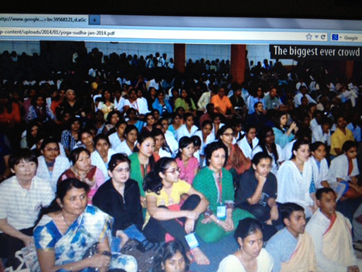 An estimated 3500 people watched the show on January 4, 2014 in Mysore. 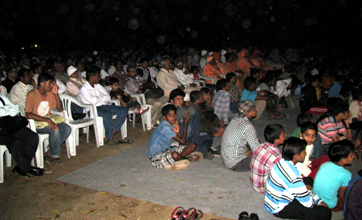 (Right) A part of the crowd in the audience under open sky. 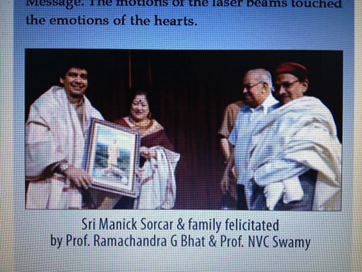 “We are indeed inspired and amazed to witness the unique laser show by Mr. Manick Sorcar…The devotional fervour and technological expertise with which Mr. Sorcar has captured the life and message of Swami Vivekananda is simply marvelous! 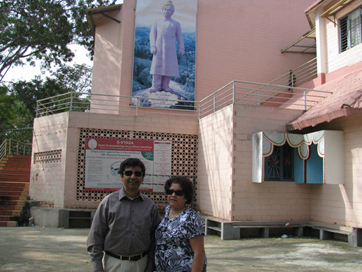 It is a unique experience for anybody to get glued to the laser show for one hour which unveils the life and message of Swami Vivekananda and get transported into an entirely different world”, wrote Swami Muktidananda, Adhyaksha, of the Ramakrishna Ashrama, Mysore. Performed at the Ramakrishna Math, Pune. The show took place at the exterior, where an enclosed, massive stage was built by RKM to the specifications of MSP. An estimated 3,500 people watched the show. January 7, 2014. A part of the crowd in the audience in Pune. The chairs were placed starting 30 ft away from the stage, extended up to 1000 ft at the rear. Finding no seats, children decided to sit on the carpet on ground within the 30 ft. “..The show was much appreciated by viewers at Pune…Audience was spellbound while watching the show. Incidents for the life of Swami Vivekananda presented were carefully chosen to propagate message, and were faithful to the literature published by Ramakrishna Math and Ramakrishna Mission”, wrote Swami Srikantananda, Adhyaksha, Ramakrishna Math, Pune. (Left) A small poster near the entry of the Holy Temple at Ramakrishna Math, Mumbai. (Right) An attractive publicity poster in Mumbai. (Above) January 8, 2014, at the famous St. Andrews Auditorium, Mumbai. An auditorium of 850 capacity was jam packed with many sitting on the steps, standing at the sides and far end to watch the show. The show was a tremendous success. The Sorcars were felicitated at the end of the show amidst a cheering crowd.. 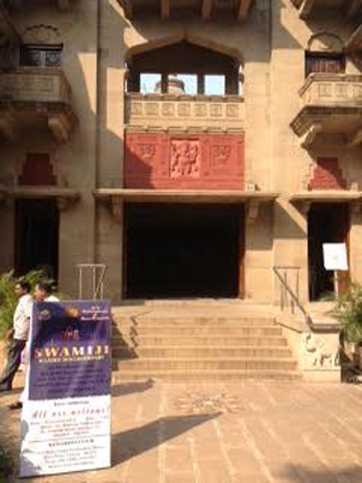 Performed at the St. Andrew’s Auditorium, Bandra, Mumbai, for the Ramakrishna Math, Mumbai. An auditorium of 850 capacity was jam packed with many sitting on the steps and standing at the sides and far end to watch the show. The Sorcars were felicitated at the end of the show amidst a thunder of applause. (Watch for more news and pictures). (Above) Near the bill board for the Concluding Programmes in Delhi. "The uniqueness of the show is the glimpses of Swami Vivekananda’s contribution to religious harmony with his soul-stirring messages, which are depicted very powerfully in the show. ", said Swami Shantatmananda, secretary Ramakrishna Mission, Delhi. 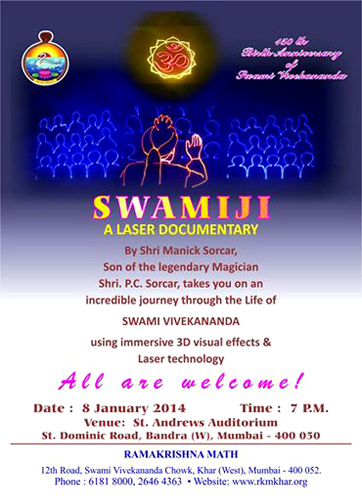 The laser show took place on January 11, 2014, at the Thyagaraja Sports Complex. 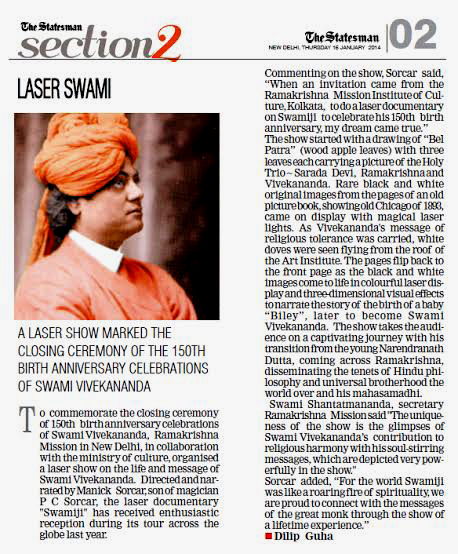 “A laser show marked the closing ceremony of the 150th birth anniversary celebrations of Swami Vivekananda….To commemorate the closing ceremony of 150th birth anniversary celebrations of Swami Vivekananda, Ramakrishna Mission in New Delhi, in collaboration with the ministry of culture, organised a laser show on the life and message of Swami Vivekananda…. Swami Shantatmananda, secretary Ramakrishna Mission said "The uniqueness of the show is the glimpses of Swami Vivekananda’s contribution to religious harmony with his soul-stirring messages, which are depicted very powerfully in the show". (Above) Reproduced from The Statesman, covering the news of the Delhi show. 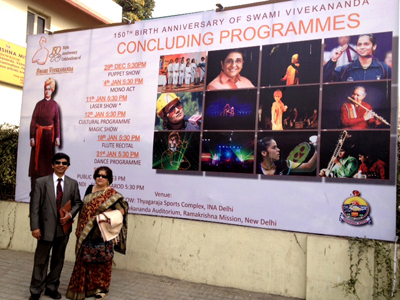 Performed at the renowned Thyagaraja Sports Complex, Shri Ganganath Marg, INA, Delhi, on January 11, 2014. An estimated over 5500 people watched the show at the indoor stadium. This is the last show of the series, awaiting performance at the custom-built, massive, covered auditorium and stage by the bank of river Ganges, within the Belur Math campus. According to RKM an estimated 10,000 to 12,000 people are expected to watch the show. More about this later.